While it's very predictable to expect an AlDub fan to like Imagine You and Me and a basher to say the opposite; a former fan like me can probably tip the scale. I wasn't among the first to follow AlDub (Alden-Yaya Dub) but I got hooked after seeing the first few episodes on YouTube. It was about a year ago when their love team was just blossoming. I had since then been watching every Kalyeserye episode. I even attended the Tamang Panahon concert at the Philippine Arena last October 2015. I also collected AlDub magazines. The rest of the post is here. But long before Christmas, my interest faded. I was still able to watch the Metro Manila Film Festival movie, My Bebe Love, which co-stars Alden Richards and Maine Mendoza along with Vic Sotto and Ai Ai Delas Alas. So while I was never a 100% loyal fan because I never followed them like crazy and actually pointed out issues from time to time, I was still part of the AlDub phenomenon. Today, since I can no longer affiliate myself with the fandom nor can I be labelled a hater, I'll be able to post a review from a middle of the road perspective. This is what definitely blew me away. Every nook and corner of Como, Italy is fascinating. The movie incorporated the overall scenery well to make it a necessary part of everything. You cannot do away with any other location. I was expecting the usual love story of a you and me against the world conflict but it was a different type of Romeo and Juliet flavor. While the forlorn lovers of Verona are more known for their tragic love story, it wasn't the highlight of the script. It just focused on the purity of their love despite the tragedy after. How "'Tis better to have loved and lost than never to have loved at all," borrowing that line from Alfred Lord Tennyson is truer than ever. But we are indeed certainly glad that God did not take Juliet from Romeo in the movie and of course vice-versa. I can't help but still compare it with the old Eat Bulaga Kalserye theme though. It's very Cinderella-ish. Gara or Graciana (Maine) is like numerous Pinays in Italy who clean various homes for a living. Andrew (Alden) on the other hand depicts a real life prince - son of a rich Italian with a Pinay. It's also reminiscent of how AlDub came to be - that everything is interconnected into destiny. There are no coincidence. All details are like fate's way of intricately connecting the dots for your one true love. Imagine You and Me uses the same theme. The script blends all elements naturally, without having to force it, particularly drama and rom-com. It's not overtly dramatic nor was it forcefully funny. It's just a matching mix of both. I can play the comic lines over and over and still find them funny. I particularly enjoyed the comedic use of song lyrics. I also love the songs used throughout the movie by the way. April Boy Regino's "Di Ko Kayang Tanggapin" never gets old. It looks like Maine Mendoza can record songs too even if she's not a powerful singer. She even wrote the lyrics for the theme song. Alden has been in the industry for quite some time now so it is but expected for him to perform well. While expectation isn't much for his on-screen partner, Maine, she actually delivered the goods too. Some viewers noted the lack of a stylist for her during the filming but her role does require being a simpleton due to her character's line of work. All other supporting stars including Ms. Irma Adlawan, Jasmin Curtis-Smith, Cacai Bautista, and Kai Cortez were very effective for their roles too. I didn't find a need to point out any flaws. While Imagine You and Me is not perfect, it's perfect for what it was filmed for. 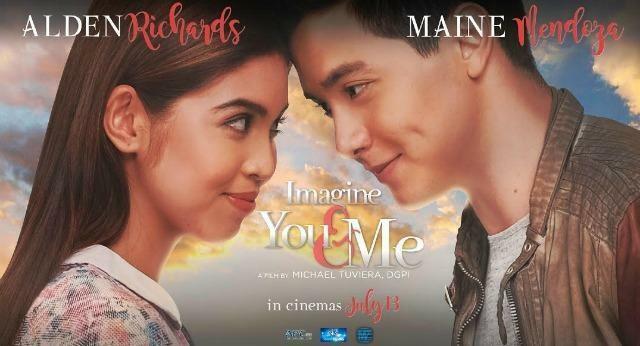 The AlDub nation will definitely not be disappointed by the film as a whole. After one full year since the love team started, they finally offered a proper on screen kiss. Plus, there's a teaser of an Alden ❤ Maine lock chain if you waited past the movie credits.